Your satisfaction is always guaranteed no matter what. Add little details to your home for efficiency. 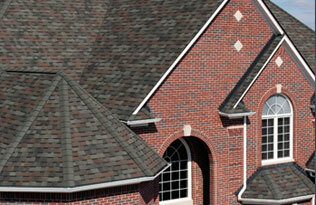 You can count on our Owen’s Corning shingles to keep your roof it’s strongest and looking great. We offer custom attic ventilation for proper intake and proper exhaust, as well as seamless gutter installations to keep your roof it’s cleanest. Protect Your Roof. Protect Your Home. Your roof plays a vital role for your home. Its job is to protect your home. That is it’s only job. It is not meant to heat or insulate your home – That’s what insulation is for. Our professional team of roofing specialists are here to help you! We provide FREE estimates and consultations which include a full roof inspection, chimney inspection, insulation inspection, and ventilation inspection. Repairing roofing issues seems to be a need for many of our customers. We will work with any repair, big or small. At Kevin Sterwald Roofing, we take the time to inspect every inch of the problem to make sure it’s repaired properly. We’re not going to make a fast “patch-up” and hope the problem goes away. Often times, the immediate problem stems from another issue so we look to diagnose the root of the problem to resolve it entirely. Our work is guaranteed for years to come. In the rare event that a roofing repair is not resolved the first time, we’ll come back and make any corrections necessary until it’s completely repaired. Our customers’ satisfaction is our top priority. We proudly service Watertown, WI and all surrounding communities. Call us today at (920) 988-1072. We look forward to working with you! Let us assist you with complete roofing services today. Call or visit us for your appointment.